Biting your fingernails is an unattractive habit that's hard to break. There can be serious side-effects, so the sooner you stop, the better. Excessive biting can cause diseases, infections, and in some instances, affect your self-esteem. Not to mention annoying snags left in your clothing and pantyhose. Worse yet, some cases of nail biting can lead to the extreme; biting the entire nail off. Fingernail biting can be triggered by many factors, but mainly nervousness and stress. Most often, people don't realize they're doing it. The key to stopping is pure determination. The first step is to realize when you're doing it. Here are several ways to stop this habit. 1) Try dipping your nails in nail polish remover. The bitter taste will remind you to stop. Be careful to keep your fingers away from your eyes and reapply it if you wash your hands. You could also try nail biting solutions which work in a similar way. 2) Carry around an emery board, file or clippers to trim your nails. The shorter your nails are, the harder it is to bite them. 3) When you're at home, wear gloves. As strange as it may sound, it's an easy way to prevent access to your nails. 4) Wear false finger-nails or get them professionally applied. If you spend money on them, you're less likely to take them off. You'll also get the pleasure of wearing beautiful, long nails. 5) When you get the urge to bite, substitute a different habit such as tapping your fingers. 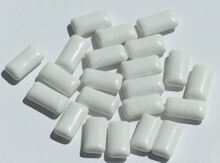 6) Keep your mouth occupied with chewing gum or hard candy. 7) Try to reduce stress, which is usually the source of the problem. Try some yoga or relaxation techniques. Exercise is not only good for your body, but it reduces tension as well. Biting your fingernails ruins the appearance of your hands and is overall, unappealing. Once you break the habit, you'll be pleasantly surprised by how much better they look, particularly in a professional environment.